I don't understand your art, Kevin. I heard about Alchimia Apothecary months ago on Reddit, and I hadn't intended to bother with it because I'm trying to NOT discover new perfumes and just enjoy the huge amount I already have. However, the company owner Erin also frequents that particular subreddit, and her helpful, considered responses to people's questions about perfumes generally made me think, 'Well, this chick knows what she's talking about.' So I thought I'd just try out a few because I can pretty much justify any purchase to myself. I ordered a set of 5 samples and a set of 3 samples - a total of 8 (yay, I can do maths!). I ordered on 22 November, and they were shipped 27 November. They took forever to get to me - I think I finally received them on New Year's Eve. I put this down to a combination of the time of the year, a backlog in customs and our generally rubbish postal service, because they were definitely shipped within a reasonable amount of time. Erin actually contacted me about a week before Christmas to ask if I'd received it as she'd sent out a bunch at the same time and the only other one that hadn't arrived yet was another Australian customer. I wasn't worried - I know the drill, I knew they'd show up eventually. And they did! When it arrived, my order was wrapped in cute orange bubble wrap with a sticker but I didn't think to take any pictures of the wrapping. The vials are brown, and I don't think I've ever seen that before. I thought that was pretty cool - darker storage is always better for perfume oils. There was an extra free sample of one of the Yule perfumes, and a special surprise that I'm saving until last. Druid Fluid is a bright, fresh floral with a zingy green note. It's very much in what I refer to as the 'old lady garden' category. I liked it a lot, and I'll probably pick up a full size at some point. This kind of perfume is definitely my jam. In Ovation is something I have never come across before - a summery vanilla. I can't really describe what it is about it that's summery, but it definitely is. Noodles says it smells a bit like lime, but I don't really get that myself. Magma is sweet and fruity and a little bit fizzy. It's a very young perfume to me, kind of lollyish and doesn't change much. I like it, but I'm way too old for it. A la Gory has a massive hit of cherry in the vial and wet on the skin - that was all I could smell at first. However, the cherry note faded quickly, and then I was left with a sweet, kind of soapy floral smell for a while, not really foody. Half an hour or so later the dry down is sweet vanilla biscuit. I liked the dry down but it's quite similar to a few other cake/pastry perfumes I already have. SeaCret is an ozone perfume with a slight musk note in the dry down. Ozones are not my cup of tea at all but I think people who like them would really enjoy this version. Caramel Knowledge had what I thought was another strong hit of cherry, but then realised it was almonds. I don't know why but I always confuse those two notes. Thankfully (because I hate almond), it goes away within a minute or two and then I'm left with a kind of sweet and soapy, clean smell - creamy luxury soap. Oddly I didn't get any kind of foodiness from this one at all after the almond, and I expected it to be the most overtly gourmand. It's nice enough, but on me it just smells like a really expensive soap. Hue Bris smells like old school fruit sticks - you know the green and orange ones? It's a bit sweet and fizzy and a tiny bit floral. Several hours later it smelled like a musky rose. I liked that element quite a lot, but the initial lolly notes didn't really grab me - again, I'm too old for that. Sinning Saints is my Yule freebie, a spicy peppery rose. The rose amped like crazy on me with this one and it was all I could smell for about 12 hours. It was nice, but a bit much on a hot day. If you're as good as me at maths you will notice that's actually 8 samples, not 9. I also have Hook but I've lost it somewhere in the house. It will turn up eventually. Now, a few weeks before I ordered, there was a discussion on Reddit about what kind of themes people would like to see in indie makeup and/or perfume, and I mentioned a conversation that Noodles and I had once had about how there should be a collection of Freaks and Geeks perfumes. We spent ages thinking about possible note combinations like diesel oil and cannabis for Daniel and so on. I don’t remember them all now and I really wish I’d written them down at the time. Anyway, one of the ones I did remember and mentioned in the Reddit discussion was bubblegum and tobacco for Kim Kelly. Erin and I had a brief little chat about how awesome Freaks and Geeks is, and I’d mentioned something like chocolate milk and peanut butter for Bill (thinking of the scene where he eats a sandwich while laughing at the television) and Erin reminded me that Bill was deathly allergic to peanuts. And that was about it. But then my order turns up with a bottle of a perfume called… KIM KELLY. I was thrilled that Erin was thoughtful enough to not only remember having that specific conversation with me, but that she then went and specially made me a perfume from it. And it’s really good – the bubblegum and tobacco are the opening notes, and it smells exactly like someone smoking and chewing Hubba Bubba. The other notes are violet, black agar, benzoin resin, ambergris, and spice. The dry down is still ever so slightly sweet from the bubblegum, but that's in the background while the benzoin and violet create a lovely floral woody note. I love this perfume - it's what I have always wanted every other bubblegum perfume to be, rather than the sickly sweet Lolitaesque concoctions they usually are. And it is just how I imagine Kim Kelly would have smelled. I hope Erin does do a whole Freaks and Geeks collection one day, because I would be first in line to buy them. As well as her listings, Erin also makes custom perfumes and I’ve seen many a happy customer rave about their own personal scent on Reddit. She also sells solid perfumes and some face care products, but I have not tried any of those as yet. 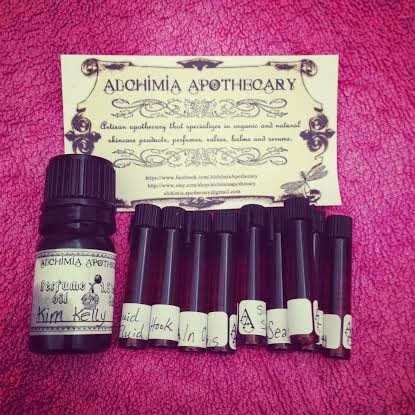 In conclusion, Alchimia Apothecary is a shop well worth checking out if you’re into perfume oils. That is a pretty darn awesome shopping experience right there! There's something about the shop's aesthetic that doesn't do much for me, maybe the black and white feels a little stark and "meh". I kept thinking of Alkemia when I read the name and the punny scent names were starting to annoy me when I was browsing, but they're still new so maybe still refining their style. I do love the Freaks and Geeks theme though and Kim Kelly sounds very interesting! I watched the one with Bill's mother dating Coach Fredericks a couple weeks ago. He ate a grilled cheese sandwich in that one, I wonder how that would translate in scent, ha ha. It is very cool the owner made a scent for you based on your ideas, so maybe when I'm less broke I will check out some samples. Yes, I'm not a fan of punny names - THANKS FOR THAT TREND OPI. I talk about stuff that interests me. Teen in the 80s, still stuck in the 90s. Watch too much TV and don't read enough books. Love bacon, Paul Rudd, perfume and makeup in that order.